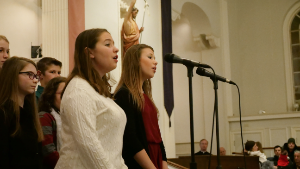 St. John’s has two distinct choirs and musical ensembles. Our Children's Choir is for our younger students in grades 2 to 4. This group primarily sings during school liturgies, school concerts and special events. 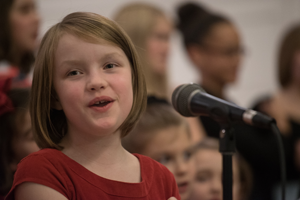 The St. John’s Singers is an audition-only group available for students in grades 5 to 8. They are the ‘varsity team’ of our performing arts sector. They delve deeper into their knowledge of music and their singing abilities - focusing on difficult literatures and singing harmony. Ms Colleen Stringer, our Director of Music, is a talented musician who plays several instruments herself. She offers after-school private and group lessons for an additional fee to our students. All students receive music instruction as part of our regular curriculum programming that spans a broad spectrum, including composition, methods, and performance techniques. Music history and composers are also explored, from the classical greats to today's performers. Students have many opportunities to work with various instruments and experience varying vocal techniques, as well.